It's the morning after for America's biggest micro brewer. Shares of the Boston Beer Company (SAM), maker of Samuel Adams and other craft beers, plunged nearly 11% Thursday. The hangover comes a day after Boston Beer reported earnings that badly missed analysts' expectations. Boston Beer earned 51 cents per share in the first three months of 2013, down almost 9% from a year earlier and well below the 62 cents a share expected by analysts. Despite the drop in earnings, revenue rose 20% in the quarter as demand for cider and hard iced tea offset weakness in demand for the company's flagship Sam Adams beer. Boston Beer blamed the drop in earnings on increased spending on advertising and marketing, as well as higher costs for certain raw materials. The company maintained its outlook for full-year earnings, but acknowledged that the fast-growing market for craft beers is becoming increasingly competitive. As demand for premium beers has exploded over the past few years, Boston Beer has seen its stock price soar. The stock recently hit a high above $170 a share, up from a low of about $25 in 2008. 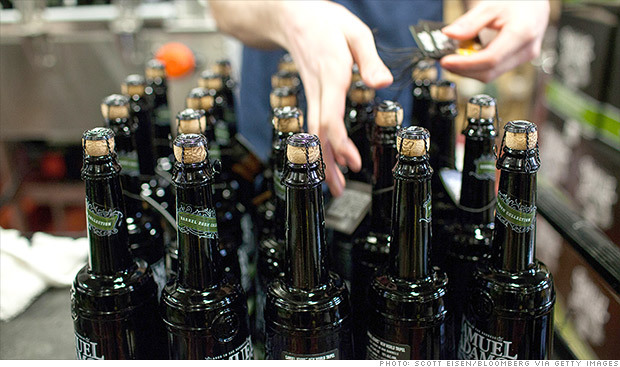 After a nice run, investors are bailing on the maker of Sam Adams. Big brewers have also jumped on the craft-beer bandwagon. Anheuser Busch Inbev (BUD) launched Black Crown, a premium version of Budweiser, and MillCoors (a joint venture of SABMiller and Molson Coors (TAP)) has introduced Third Shift Amber Lager. Meanwhile, the number of small breweries opening up shop continues to skyrocket. Jim Koch, chairman and founder of Boston Beer, told analysts on a conference call that there are probably two new micro breweries opened every day. All told, he expects there to be a total of 800 new craft brews launched this year. "It's just an extremely competitive landscape from above and below," said Koch. The good news, he said, is that demand for craft beers is still growing "in double digits," adding that Boston Beer will continue "riding that wave." Caroline Levy, an analyst at Credit Agricole's CLSA, lowered her outlook for Boston Beer's earnings and downgraded the stock to under perform. At the same time, she raised her price target for the stock to $170 a share from $165 a share. The company still has a leading franchise and strong sales, Levy said, but there's limited upside for the stock. StockTwits traders were driven to drink over the disappointing results and dismal stock performance. $SAM Anybody got a beer? Needless to say, short sellers were happy to see the stock take a dive. There was even a response to Boston Beer's decision to introduce a canned version of Samuel Adams later this month.